Is this the location where you get your slab stone? I rock hound in Washington during the summer. AZ is too freakin hot so I leave it to the snakes, havelinas and coyotes until late fall. A friend of mine left me 25lbs of copper ore in a box over the summer. I washed it and it looks slab and cab worthy. I have never worked with C/O before. Is the blue silicate referred to as chrysocolla, or is it some other mineral or by product of the copper present in the rock? I feel so naive asking these questions. Very nice . The rock looks hard .I'm glad I'm old and don't have to worry about that anymore, I just buy now which is not very exciting . This particular mine I have gotten very little from. Maybe 10-20 pounds. Not much high quality material there. The walls look great at first glance but if you looked at it closely in person the veins are very thin and thus not really cabbable. I would like to cut out that one section in the right half of the last photo just a display piece. Now chrysocolla is actually a very soft stone. Softer than turquoise, which normally needs stabilization. Chrysocolla also has a lower density than turquoise, does not contain phosphate and does not dissolve in acid. 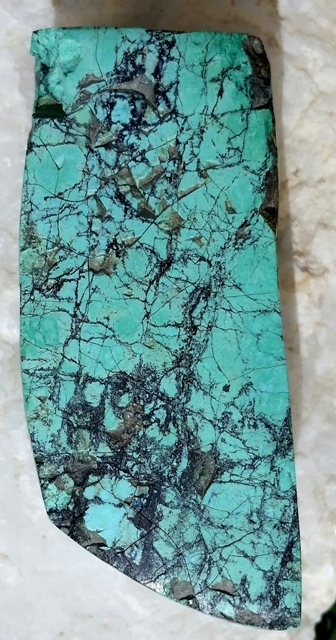 This material is naturally hard, has the density of turquoise that is too high for chrysocolla, tested high in phosphate and dissolves in acid yet this so-called "expert" called it "crapcolla". And a guy on the turquoise boards told me that he did not care what my chemistry sets say that he had something like 40 years experience with turquoise and said it was chrysocolla. 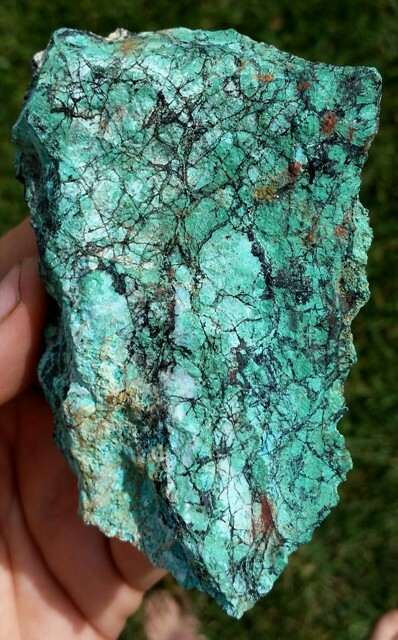 How can it be chrysocolla when everything points to it being turquoise including proper density and high level of phosphorus not even found in chrysocolla? Point is that it seems like even many of the self proclaimed "experts" really have no clue what they are talking about, which adds to the confusion. Stones can often be very hard to ID just from photos to begin with. That is why we run tests such as hardness, density, streak tests, chemical make up, acid dissolution, etc. to get ID on many stones. In this case these people who ran no tests on the stone simply concluded chrysocolla because that is the general term used for unidentified copper ores even though chrysocolla is a specific stone. That is like calling jaspers and agates quartz because they all contain silicon dioxide. So don't feel naive, even the self proclaimed "experts" often have no clue what they are talking about. I also ran across some information recently that states that a lot of the stone being sold as turquoise by the turquoise dealers is not really turquoise but rather planterite. Again testing is required to differentiate the two. You cannot always identify the stone just by look. Sometimes the term chrysocolla is just used for convenience. 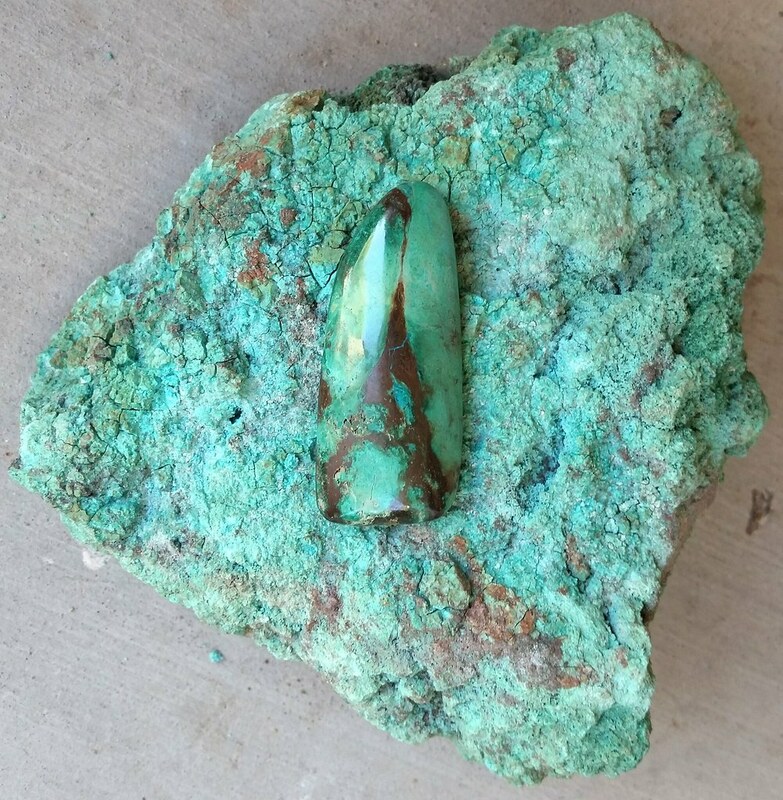 For example the term chrysocolla is often applied to the copper ores here in Nevada by our lapidary club because there is such a mix of copper minerals in the ore. 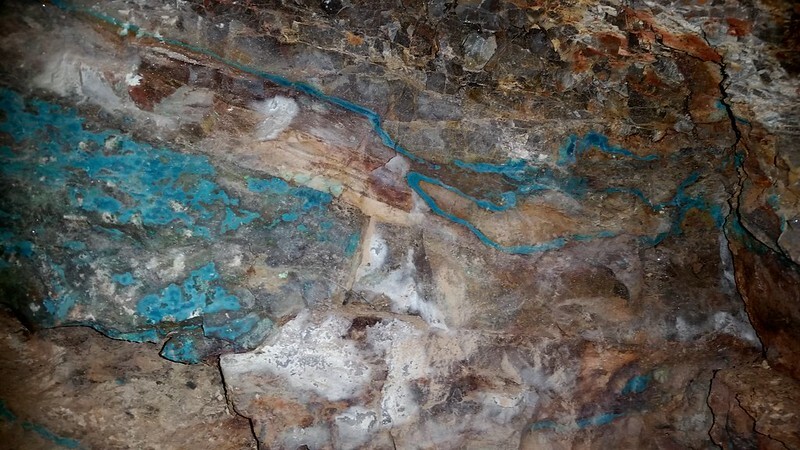 The ores here can contain a wide variety of copper minerals including chrysocolla, azurite, malachite, dioptase, rosasite, covalite, and various other rarely heard of copper minerals. So most people just lump it all together with the general term (not mineral) chrysocolla. I prefer to use the term copper ore to reduce confusion. Finally there is silicated chysocolla, which is not chrysocolla either. Silicated chrysocolla, which also includes gem silica, is actually chalcedony stained with copper salts. Even though it contains silica and copper just like chrysocolla the copper is not pat of the silica complex and chrysocolla is very soft as where silicated chrysocolla is very hard. Thanks for the chrysocolla lesson. 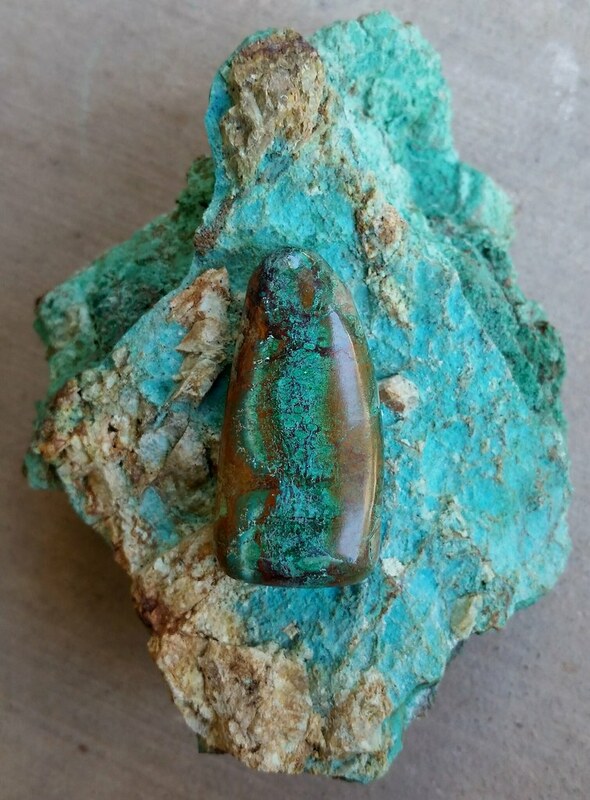 I suppose I have been guilty of calling copper complex "blue" stones chrysocolla when most of the stone is blue. I do call copper complex stones exactly that when there is a definite mix of different stuff in there. My favorites are, of course, copper ore with actual copper veins in them. Hard to find that rough anymore. BTW, those mine walls are gorgeous! Isn't it annoying that a "name" can have such severe consequences when it comes to value? 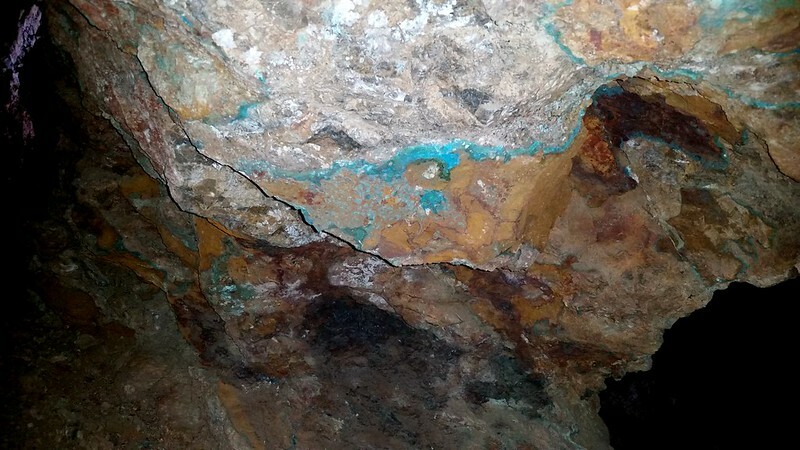 If you find a bunch of "turquoise" it's a gold mine but if it's "chrysocolla" it's a total bust. As if Nature is black and white without any mixtures of minerals. Marketing. Just like how they make it seem like diamonds are rare when in fact they are very abundant, just controlled. Even the use in engagement rings is a fairly new concept, around the 1930 if I recall right, and it was all due to marketing again. Brown diamonds used to be considered garbage. Now with some clever marketing and named like cognac, champagne and root beer the brown diamonds are now so popular. Other stones are not much different. There are a lot of stones prettier than diamonds and turquoise but they are not as popular or valuable due to what we are told should be more valuable. I used to not even like turquoise. Virtually everything I saw was blah and looked and felt like plastic due to stabilization with epoxy. 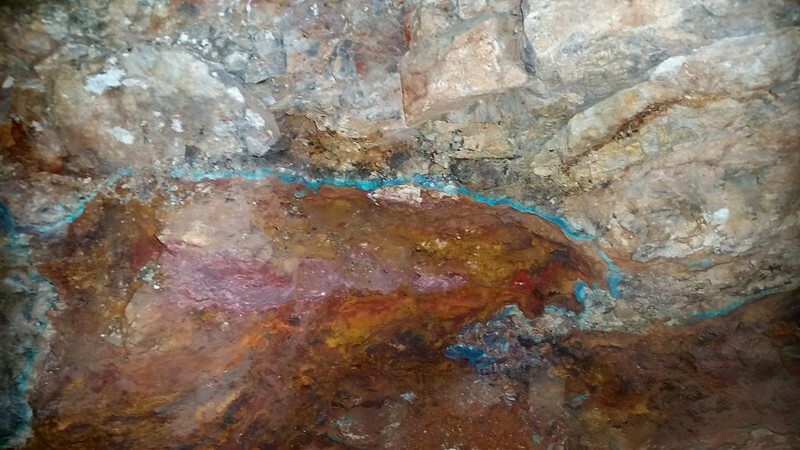 It was not until I started digging this stuff and cabbing it that I got a appreciation for turquoise. Especially researching it ans seeing the numerous colors (over 70) and patterns some of which unless you were told you would never know was turquoise. And again there is a perception of value. In the Middle East the pure robin egg blue with no veining (veins are looked upon as flaws) are highly desired and considered highly valuable. In the U.S. the veined blue turquoise is most prized. Green used to be considered garbage but is now gaining popularity. That is very cool James! Thank's for the lesson on turquoise. I think a lot of people don't know what real turquoise is.Thank's for knowledge on the subject. Thank you this was indeed very helpful for me. James is right. Much of the turquoise here in AZ and NM looks like it came from an extrusion machine, with its pure blue, waxy appearance. Yet, there is a high concentration of people at many of these rock shows around this area selling this stuff like they have a "secret" mine. I became bored with turquoise, until I saw some Bisby rough and cabs. Beautiful stuff and the inclusions, or veins bring up the hardness level so you do not have to epoxy the material as much or any. This material is basically mined out, although you can rarely find some in the SE NM & AZ border towns. 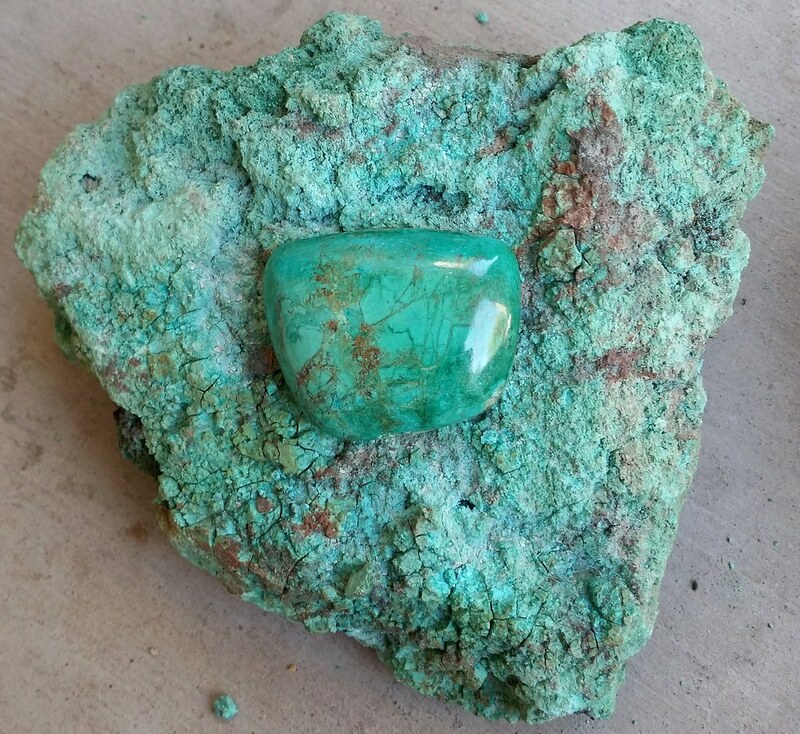 Here is what I believe is turquoise I mined in Nevada. This is all naturally hard. The last two pics are raw pieces I just face polished. Unfortunately I have not found much at that mine. Maybe 15-20 pounds.